£23,000 was raised by 66 supporters — that's teamwork! The Entrepreneurial Refugee Network (TERN) assists refugees in becoming self-reliant through their own enterprises, proving that #ThisRefugeeCan. When you read that phrase, what do you think of? What do you want to know next? For most, it is the story. The story of where they have come from, what they have gone through and how they have struggled... how they have survived. But at The Entrepreneurial Refugee Network (TERN), we believe there are more important questions: what are your skills? What are your ambitions? For we believe that refugees are not defined by their struggle, but what they have achieved and what they can achieve. This is why we exist: to assist refugee entrepreneurs in becoming self-reliant through entrepreneurship. We work with the refugee entrepreneurs we support to transform public perceptions of refugees’ capacities and ability to contribute to host country economies and communities. Together, we can transform decision making by governments and investors to create a more favourable climate for refugee integration, entrepreneurship and innovation. #ThisRefugeeCan: When enabled, refugees can achieve anything. Our journey began in August 2016: we designed and delivered a first pilot entrepreneurship support programme to 3 refugees. Building on the success of that inaugural programme, we launched TERN's First Flight cohort in February 2017, taking on 16 entrepreneurs from over 60 applications into our incubator programme. Over the next 4 weeks of the campaign, we will have the great pleasure of introducing you to 4 of these amazing entrepreneurs: Gulwali, Aomar, Faith & Ahmad. Each with their own talents, unique ideas and a lot of passion! They are shining examples of our belief that there are no limits to what #ThisRefugeeCan achieve. This is where you come in. We need your support to ensure that we can continue to give refugee entrepreneurs the platform they deserve. Through your contributions, we will be able to run the two next stages of our programme. 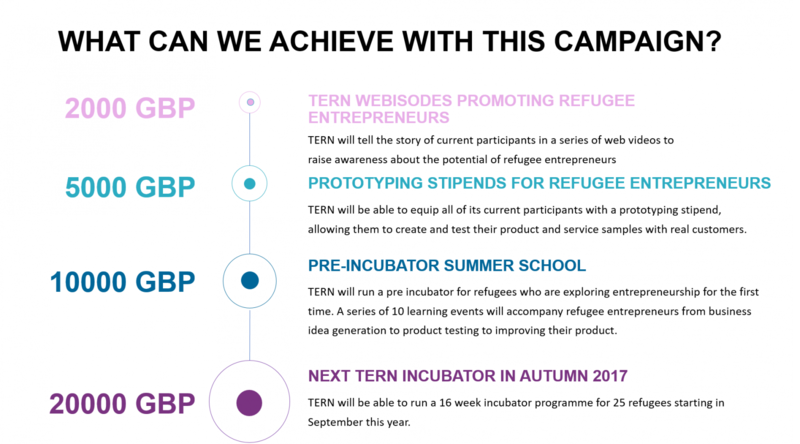 If we meet our crowdfunding target, we will be able to train and support 60 more refugees and provide start-up incubator support to 25 of them. Every £800 pounds allows us to support one more refugee within our incubator. At the end of 2014, there were 117,161 refugees and 36,383 pending asylum cases in the UK. This number has only increased since then as the UK moves towards meeting its target of accepting 20,000 Syrian refugees by 2020. Ensuring the successful inclusion of this diaspora into host societies represents one of the great challenges, and opportunities, of our times. However, this is a challenge that by most metrics we are currently failing. In the UK, refugee unemployment is 6 times the national average, despite over 30% of these refugees having over 10 years of education before they arrive (via Home Office research). Highly-skilled refugees are struggling to access employment in their domain. As a result, they naturally turn towards entrepreneurship as a more direct way into the economy (47.4 % of a refugee sample had either considered starting or had already started a business at some point in their life). Despite this, high potential refugee entrepreneurs are often constrained by a lack of familiarity with the local marketplace, a lack of access to host country business networks, and by their limited credit history when it comes to accessing start-up capital. The basis of this programme is that refugees do not need to be 'taught' how to run a successful business, but just given an equal platform from which to operate. For us, this is driven by a support structure that has experience and expertise at its heart, provided by our mentors and expert advisors. These support groups, as outlined in the diagram below, are there to offer the local market guidance and knowledge that is often the crucial missing link in allowing refugee entrepreneurs to flourish. 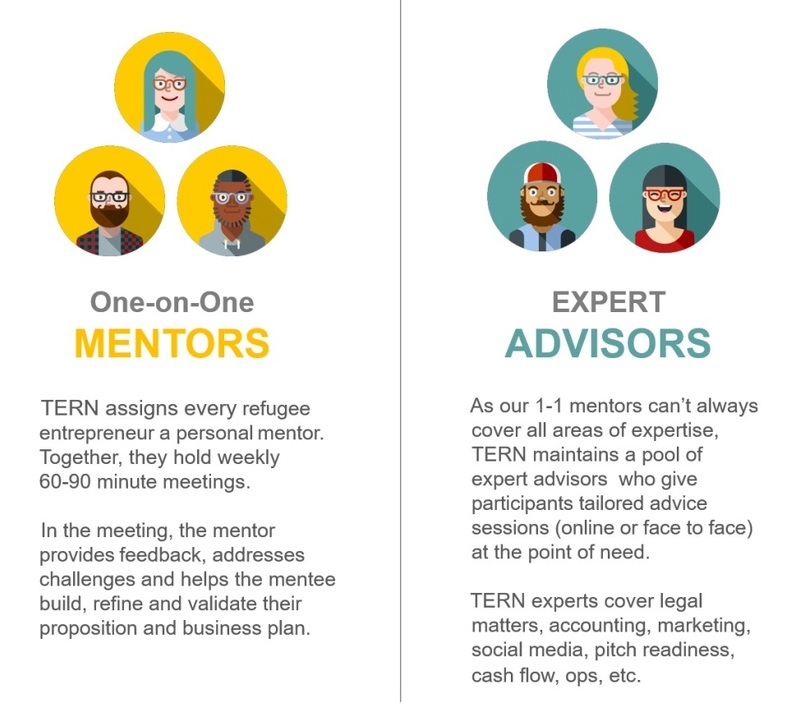 It is through these networks that the refugees build towards financing, with TERN working with established financial partners to provide investment into a community traditionally marginalised from mainstream lending. 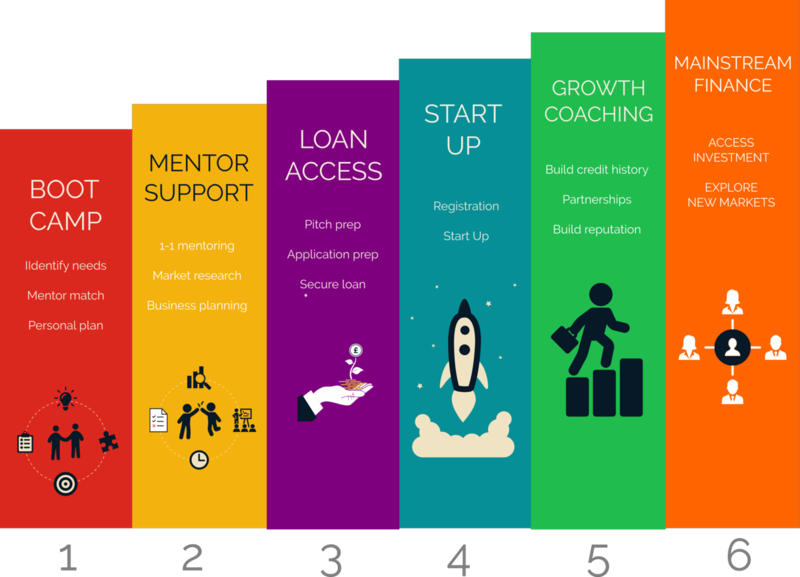 By giving entrepreneurs access to seed finance (average loan size is between £10,000 - 20,000), the aim is not just to give them the capital to start their business but the opportunity to build a credit history that ultimately makes gaining access to mainstream finance and subsequently scaling their enterprise feasible. This, ultimately, is what our #ThisRefugeeCan campaign is all about, striving to demonstrate that the term 'refugee entrepreneur' is not a contradiction, but a statement of the obvious. At TERN we have seen that those who have had to flee their homes, leave their families and chase and fight for a new life, do not suit comfortable in the category of the ‘helpless’, nor do they accept the label of the ‘victim’. Instead, they are driven to succeed, ambitious to create their own change and talented enough to do it. We just need to make sure we don’t stand in their way! 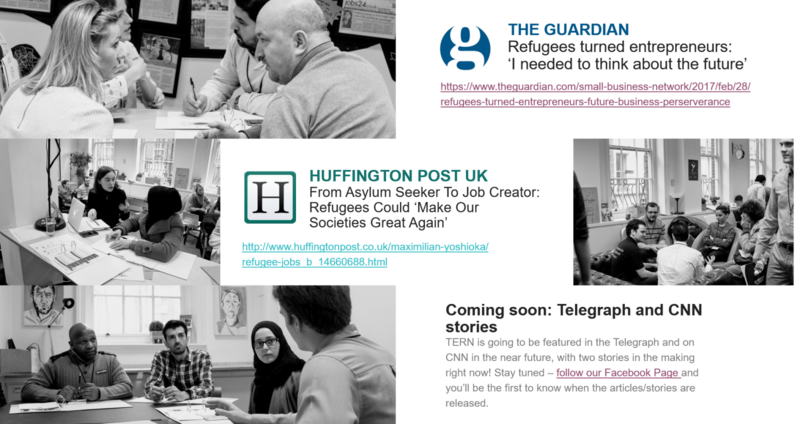 Alongside joining TERNs monthly newsletter that will keep you up to date with all things refugee entrepreneur, you will also have your name added onto our #ThisRefugeeCan supporters wall on our website. On top of joining our network and supporters wall, you will receive a signed copy of TERN champion Gulwali Passerly's amazing book 'The Lightless Sky' in which he describes his incredible journey across Europe from Afghanistan as a 12-year-old, and his even more incredible achievements since. Alongside being welcomed into the TERN network, you will receive our specially commissioned T-Shirt. It is designed in coordination with specialist company 3rd Rail Clothing to question what we traditionally understand by the term refugee, and demonstrate that too often we define & constrain refugees by their victimhood, ignoring the skill & ambition they posses. All of the above rewards rolled into one awesome package, sprinkled with a few further benefits. These include your name being added as a major donor onto #ThisRefugeeCan donor wall, and free and unlimited access to all future TERN events. Differentiated from our previous rewards, this is an opportunity to become a corporate supporter of TERN. This package includes having your brand's logo recognised as an official sponsor via social media and on our website, as well as bespoke posts detailing your support. Additional to this, you will guarantee meeting with the TERN team at your request to explore further avenues of collaboration.